There are several carrageenans, differing in their chemical structure and properties, and therefore in their uses. The carrageenans of commercial interest are called iota, kappa and lambda. Their uses are related to their ability to form thick solution or gels, and they vary as follows. Elastic gels formed with calcium salts. Clear gel with no bleeding of liquid (no synaeresis). Strong, rigid gel, formed with potassium salts. Brittle gel forms with calcium salts. Slightly opaque gel, becomes clear with sugar addition. No gel formation, forms high viscosity solutions. The carrageenan composition in red seaweeds differs from one species to another. mixture of kappa and lambda. There are two different methods of producing carrageenan, based on different principles. In the original method - the only one used until the late 1970s-early 1980s - the carrageenan is extracted from the seaweed into an aqueous solution, the seaweed residue is removed by filtration and then the carrageenan is recovered from the solution, eventually as a dry solid containing little else than carrageenan. This recovery process is difficult and expensive relative to the costs of the second method. In the second method, the carrageenan is never actually extracted from the seaweed. Rather the principle is to wash everything out of the seaweed that will dissolve in alkali and water, leaving the carrageenan and other insoluble matter behind. This insoluble residue, consisting largely of carrageenan and cellulose, is then dried and sold as semi-refined carrageean (SRC). Because the carrageenan does not need to be recovered from solution, the process is much shorter and cheaper. Refined carrageenan is the original carrageenan and until the late 1970s-early 1980s was simply called carrageenan. It is now sometimes called filtered carrageenan. It was first made from Chondrus crispus, but now the process is applied to all of the above algae. The seaweed is washed to remove sand, salts and other foreign matter. It is then heated with water containing an alkali, such as sodium hydroxide, for several hours, with the time depending on the seaweeds being extracted and determined by prior small-scale trials, or experience. Alkali is used because it causes a chemical change that leads to increased gel strength in the final product. In chemical terms, it removes some of the sulphate groups from the molecules and increases the formation of 3,6-AG: the more of the latter, the better the gel strength. The seaweed that does not dissolve is removed by centrifugation or a coarse filtration, or a combination. The solution is then filtered again, in a pressure filter using a filter aid that helps to prevent the filter cloth becoming blocked by fine, gelatinous particles. At this stage, the solution contains 1-2 percent carrageenan and this is usually concentrated to 2-3 percent by vacuum distillation and ultrafiltration. Sun drying semi-refined carrageenan (alkali treated K. alvarezii). Flow chart for the production of refined carrageenan (after Porse, 1998). The processor now has a clear solution of carrageenan and there are two methods for recovering it as a solid, both rather similar to those described previously for agar production. An alcohol-precipitation method can be used for any of the carrageenans. A gel method can be used for kappa-carrageenan only, and the gel can be dehydrated either by squeezing or by subjecting it to a freeze-thaw process. In the alcohol method, isopropanol is added until all the carrageenan is precipitated as a fibrous coagulum that is then separated using a centrifuge or screen (a fine sieve). The coagulum is pressed to remove solvent and washed with more alcohol to dehydrate it further. It is then dried and milled to an appropriate particle size, 80 mesh or finer. For the process to be economic the alcohol must be recovered, both from the liquids and the dryer, and recycled. The gel method relies on the ability of kappa carrageenan to form a gel with potassium salts. The gel may be formed in various ways. For the freeze-thaw process it is convenient to form it as spaghetti-like pieces by forcing the carrageenan solution through fine holes into a potassium chloride solution. The fine "spaghetti" is collected and washed with more potassium chloride to remove more water, pressed to remove surplus liquid and then frozen. When allowed to thaw, separation of water occurs by synaeresis, the pieces are washed with more potassium chloride, chopped up and dried in a hot air dryer. Inevitably the product contains some potassium chloride. The alternative to freeze-thaw is to force water out of the gel by applying pressure to it, using similar equipment to that used for agar (Figure 10). After squeezing for several hours the sheets of gel are chopped, dried in a hot air dryer and milled to an appropriate particle size. Many agar processors are now using their equipment and similar techniques to produce kappa carrageenan as well. Figure 45 summarizes the above processes. Semi-refined carrageenan (SRC) was the name given to the product first produced by the second method of processing noted in Section 7.1. This is the method in which the carrageenan is never actually extracted from the seaweed. In the production of SRC, Kappaphycus alvarezii, contained in a metal basket, is heated in an alkaline solution of potassium hydroxide for about two hours. The hydroxide part of the reagent penetrates the seaweed and reduces the amount of sulphate in the carrageenan, increases the 3,6-AG so the gel strength of the carrageenan in the seaweed is improved. The potassium part of the reagent combines with the carrageenan in the seaweed to produce a gel and this prevents the carrageenan from dissolving in the hot solution. However, any soluble protein, carbohydrate and salts do dissolve and are removed when the solution is drained away from the seaweed. The residue, which still looks like seaweed, is washed several times to remove the alkali and anything else that will dissolve in the water. 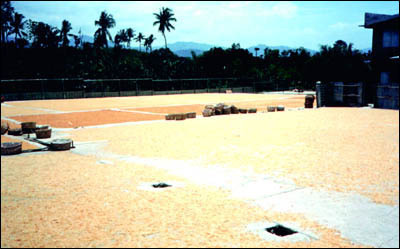 The alkali-treated seaweed is now laid out to dry; in hot climates, like the Philippines, usually on a large concrete slab (Figure 44). After about two days it is chopped and fed into a mill for grinding to the powder that is sold as SRC or seaweed flour. The above process is summarized in Figure 46 (seaweed flour branch). However, the seaweed flour is coloured, often has a high bacterial count and is not suitable for human consumption. Nevertheless it immediately found a large market in canned pet food because it is a good gelling agent and was so much cheaper than refined carrageenan. The temperatures used in the canning process destroy any bacteria so the high bacterial count in the SRC is not a problem. Sometimes the dried product is just chopped into pieces, not milled, and sold as a raw material to refined carrageenan processors. It is called alkali treated cottonii (ATC) or alkali treated cottonii chips (ATCC), or even simply cottonii chips. If this treatment is done in the country of origin of the seaweed, such as the Philippines or Indonesia, this means processors in Europe and United States of America have cheaper transport costs per tonne of carrageenan, compared with shipping dried seaweed. They have also left behind some waste products, which reduces their waste treatment costs. Flow chart for the production of seaweed flour and PES/PNG carrageenans (after Bixler, 1996). Kappaphycus alvarezii is used in this process because it contains mainly kappa carrageenan and this is the carrageenan that forms a gel with potassium salts. Iota-containing seaweeds can also be processed by his method, although the markets for iota carrageenan are significantly less than those for kappa. Lambda carrageenans do not form gels with potassium and would therefore dissolve and be lost during the alkali treatment. The simplicity of the process means the product is considerably cheaper than refined carrageenan. There is no alcohol involved that must be recovered, no distillation equipment to purify alcohol, no equipment for making gels, no refrigeration to freeze the gels, nor any expensive devices to squeeze the water from the gel. Producers in the Philippines developed a higher quality product, suitable for human consumption, by modifying the process just described for SRC. After the alkali treatment and water washing, the product is chopped and treated with bleach to remove the colour (chopping improves penetration by the bleach, and bleach also helps to reduce the bacterial count). After washing to remove any bleach, the product is dried in a closed dryer. In this type of dryer, indirectly heated hot air passes up through a bed of the unground pieces or chips that are being carried through the dryer on a chain-type belt. This closed system dryer is usually sufficient to keep the bacterial count low enough to make a human-food grade product. If bacteria reduction is required, the dried chips can be milled and then washed with alcohol (ethanol) followed by vacuum evaporation to recover the alcohol. A simpler process is to treat the milled powder with superheated steam. The above process is summarized in Figure 46 (PES/PNG carrageenan branch). The product was originally called Philippine natural grade carrageenan (PNG). Attempts to market this product as food grade in the United States of America and Europe resulted in strong opposition from the producers of refined carrageenan who did not wish to lose market share to this cheaper product. Eventually in the United States of America, the Food and Drug Administration declared it suitable for use in human food and to be labelled as "carrageenan", the same status as that of the refined product. Philippine natural grade is labelled "processed Eucheuma seaweed" or "PES", and E-407a. So PNG and PES are the same grade of carrageenan. The main difference between refined carrageenan and PNG is that PNG contains the cellulose that was in the original seaweed while in refined carrageenan this has been removed by filtration during the processing. Refined carrageenan will therefore give a clear solution, while PNG gives a cloudy solution. Where clarity of a user's product is of no consequence, PNG is suitable. Detailed information on any methods of carrageenan extraction are not easy to find. As Stanley (1987) said, they are closely guarded as trade secrets by the several manufacturers. Some information can be found in Stanley (1987), Stanley (1990) and Therkelsen (1993). A summary of the capacity of carrageenan producers according to their broad geographical location is given in Table 8, and the principal producers and distributors are listed in the next section. 1 ATC = Alkali treated cottonii or seaweed flour, used mainly for pet food. Myeong Shin Chemical Ind. Co., Ltd.
Before discussing uses, some explanations of the properties of carrageenans are necessary. Both kappa and iota carrageenan form gels with potassium and calcium salts. Aqueous solutions of both carrageenans must be heated above 60°C for the carrageenan to dissolve, and after addition of the salt, the gel forms as the solution cools. For kappa, as little as 0.5 percent in water and 0.2 percent in milk is sufficient to form gels. Kappa forms gels most strongly with potassium salts, followed by calcium salts. Potassium gives a rigid, elastic gel while calcium produces a stiff, brittle gel. Kappa gives the strongest gels of all carrageenans, but they are also the ones most likely to bleed (most subject to synaeresis). This liability can lessened in a couple of ways. If iota and lambda carrageenans are blended in with the kappa, bleeding can be reduced, so will also the rigidity and brittleness of the gel; however, the gel strength may also be lowered. Synaeresis can also be reduced by adding locust bean gum (obtained from the seeds of the carob tree (Ceratonia siliqua), growing in Spain, Italy, Cyprus, etc.). This gum also allows the amount of kappa to be reduced while still maintaining the same gel strength. The kappa can be reduced to one-third of the concentration that would be needed if no locust bean gum were used. The resulting gels are more resilient than those with kappa alone. As long as locust bean gum is cheaper than kappa there is also an economic advantage. However, the cost of locust bean gum can fluctuate depending on the harvest and demand. Iota forms gels most strongly with calcium salts, followed by potassium salts - the reverse of kappa reactivities. Calcium gels are soft and resilient and are virtually free of bleeding. They can be frozen and thawed without destroying the gel. They show an unusual property for a gel: thixotropic flow; this means the gel can be stirred and it will flow like a thick liquid, but if left to stand it will gradually reform a gel. A similar thixotropic behaviour is found with very low concentrations of kappa carrageenan in milk; a weak gel forms that is easily made to flow by shaking. The weak gel is strong enough to suspend fine particles in the milk, such as cocoa in chocolate milk. Protein reactivity of carrageenans is an important property that is utilized in several applications. Carrageenan molecules carry negative charges; this is what enables them to combine with positively charged particles like the potassium found in potassium salts. They can also combine with positively charged proteins. Carrageenan will combine with the protein in milk (casein) to form a three-dimensional gel network. The exact nature of the interaction of proteins with carrageenans appears to be more complex than this simple explanation, and the interested reader can find more detail in the references suggested in Section 7.3.8. The main applications for carrageenan are in the food industry, especially in dairy products. Frequently, only very small additions are necessary, 0.01-0.05 percent. For example, kappa carrageenan (at 0.01-0.04 percent) added to cottage cheese will prevent separation of whey, and a similar amount added to ice cream also prevents whey separation that may be caused by other gums that were added to the ice cream to control texture and ice crystal growth. The cocoa in chocolate milk can be kept in suspension by addition of similar amounts of kappa; it builds a weak thixotropic gel that is stable as long as it is not shaken strongly. Dry instant chocolate mixes, to be mixed with water or milk, can have improved stability and mouth feel using lambda or a mixture of carrageenans. Lambda or a mixture can also improve liquid coffee whiteners by preventing the separation of fat; these applications require 0.2-0.3 percent additions, but much smaller quantities will prevent fat separation in evaporated milks. Those small containers of UHT sterilized milk found in the refrigerators of some hotels may have kappa added to prevent fat and protein separation. Lambda or kappa may be added to natural cream to help maintain the lightness (incorporated air) if it is whipped. Many more uses in milk and dairy products can be found in the references below. With the appearance of bovine spongiform encephalopathy (BSE, or mad cow disease) and foot-and-mouth disease, efforts have been made to find suitable substitutes for gelatin. Gelatin jellies have long been favoured because they melt at body temperature, giving a smooth mouth feel and easy release of flavours. However, if they are stored for a day or two, they toughen and are less pleasant to eat. Gels made from iota carrageenan have the disadvantage of a high melting temperature, so they are not as smooth to eat as gelatin gels. They do not melt on hot days and do not require refrigeration to make them set, so these are advantages in hot or tropical climates, and a further advantage is that they do not toughen on storage. In the last two years there have been several claims by food ingredients companies for products, made from a mixture of hydrocolloids, that imitate the properties of gelatin. Carrageenan producers find that by combining various carrageenans with locust bean gum, konjac flour and starch, they can provide a variety of melting and non-melting gels and gel textures to meet the requirements of most of their clients. Long-life refrigerated mousse desserts, based on carrageenan and pectin rather than gelatin, are suitable for vegetarians and some ethnic groups. Conventional fruit jellies are based on pectin and a high sugar content to help set the jelly. In a low- or non-calorie jelly the pectin must be replaced, and mixtures of kappa and iota have proved to be suitable. Fruit drink mixes to be reconstituted in cold water contain sugar (or aspartame), acid and flavour. Addition of lambda carrageenan gives body and a pleasant mouth feel. Sorbet is a creamy alternative to ice cream with no fat; use of a mixed kappa and iota together with locust bean gum or pectin provides a smooth texture to the sorbet. Low-oil or no-oil salad dressings use iota or kappa to help suspend herbs, etc., and to provide the mouth feel that is expected from a normal salad dressing. The low oil content of reduced-oil mayonnaise normally gives a thin product, rather like a hand lotion; additives are needed to thicken it and to stabilize the oil-in-water emulsion. A combination of carrageenan and xanthan gum is effective. Xanthan gum is made by a bacterial fermentation process; its development was pioneered in the early 1960s by the Kelco Company, then the largest producer of alginate; it is now an accepted and widely used food additive. The interaction of carrageenan and protein can be used in the clarification of beer, with the complex formed precipitating from the wort. More water-based applications of carrageenan are given in the references below. In preparing hams, addition of carrageenan to the brine solution used in pumping improves the product because the carrageenan binds free water and interacts with the protein so that the soluble protein is retained. For successful penetration, the brine solution must have a low viscosity, but dissolved carrageenan would increase the viscosity. The carrageenan is therefore dispersed in the water after the brine salts are added; the carrageenan does not dissolve because of the high salt concentration, but as the ham cooks it does dissolve and is then effective. There is a growing consumer demand for pre-cooked poultry products such as chicken and turkey pieces. Poultry processors were concerned about the loss of water during cooking (this lowered their yield per unit weight of product) and the loss in texture and eating quality that resulted. By injecting a brine containing salt, phosphate and carrageenan into the muscle of the meat, these problems are overcome. As the meat cooks, the carrageenan binds water within the poultry muscle and improves texture and tenderness. The processors are pleased because they now have a higher yield; in fact they find that he can even add some extra water to the poultry and it will be retained. The consumer receives a better product. The carrageenan producer is pleased because about 0.5 percent carrageenan is added, much more than the 0.05-0.1 percent used in dairy products. The future looks bright for this kind of application in meat products. Hydrocolloids are being tried as fat replacements in low-fat products, with varying degrees of success. When fat or salt are reduced, meat and poultry can suffer loss of tenderness, juiciness and flavour. Low-fat products formulated with phosphates and carrageenan can have the juiciness and tenderness restored. Kappa carrageenan has been used with some success in replacing half the normal fat in frankfurters. Reduction of fat in ground meat products like hamburgers results in a different mouth feel and dry taste, which consumers do not always accept. Iota can be mixed with fresh ground beef and when cooked it provides fat-like characteristics and moisture retention that make the product more acceptable. This was the basis for McDonald's "MacLean" hamburger. This is the largest application for SRC, known as seaweed flour (see Section 7.1.2), using about 5 500 tonnes annually. Refined carrageenan could also be used, but its cost is too high and seaweed flour is about one-quarter of its price. Seaweed flour becomes an even better proposition because when combined with locust bean gum, less carrageenan is required, but this combination still gives an excellent product and it is very affordable. The meat used in canned pet foods is usually waste cuts from the abattoir. It is chopped into chunks or smaller pieces, mixed with water, flavours, seaweed flour (kappa carrageenan) and locust bean gum, canned and cooked. The two hydrocolloids help to bind the meat together and, depending on the concentrations used, either provide a thickened gravy around the meat pieces or a flavoured jelly, either of which enhances the appearance of the product as it is removed from the can. Konjac (or konjaku) gum, made from the konjac tuber or elephant yam (Amorphophallus konjac), can be used in place of locust bean gum. Konjac gels are clearer than locust bean gels and can help with costs when the price of locust bean gum rises, as it does occasionally. When you need to improve the odours in your room, air freshener gels are one of the products available at supermarkets. They are made from kappa carrageenan, a potassium salt, water and perfume. When mixed, the perfumed gel forms and it is moulded to a shape to fit the holder. When purchased, the holder is sealed; to use, the holder is opened slightly and the moisture plus perfume are gradually released from the gel. Eventually the gel dries out leaving a small residue in the holder, which is then discarded. About 200 tonne/year of seaweed flour grade of carrageenan is the estimated consumption for this application. The essential ingredients in toothpaste are chalk or a similar mild abrasive, detergent, flavour, water and a thickening agent that will provide enough body to the paste to ensure that the abrasive is kept in suspension and that there is no separation of water. A thixotropic thickener is preferable, i.e. that has gel-like properties when allowed to stand but that will flow when pressure is applied to it. Iota carrageenan, at about 1 percent, is one of the most useful thickening agents, it meets the above criteria and gives a paste that is easily rinsed from the toothbrush. When the size of the toothpaste market is considered, even at 1 percent concentration this represents a large market for iota. This application was discussed for alginates in Section 5.3.3. Carrageenan gels are another medium for immobilizing enzymes or whole cells. Kappa carrageenan gives the strongest gels and beads made from this show sufficient mechanical strength for packing in columns, and yet they are permeable to most substances. More information about the properties and applications of carrageenans can be found in the following references, the first two of which are probably the most useful: Stanley (1990), Therkelsen (1993), Nussinovitch (1997), Stanley (1987). For quick reference to a list of uses and the concentrations of carrageenan required, see Tables 3.4 and 3.5 in Thomas (1997). Natural grade carrageenan is cheaper to make and requires a smaller capital outlay, therefore its price is lower than the refined or filtered grade. Natural grade is now approved for human use in most applications and jurisdictions. For a very useful and interesting discussion of the pros and cons of refined versus natural grades in regard to their purity, composition, and comparative performance in various applications, see Bixler (1996). A summary of carrageenan markets is shown in Table 9. The total market has a value of about US$ 300 million. The marketing of carrageenan poses similar problems to those previously described in Section 5.4 for alginate. The original companies invested heavily in processing equipment and provided strong research and development facilities to assist customers and promote sales. These companies are now part of large multinationals and have a strong commitment to selling the refined carrageenan that they have always produced, and they operate at about 80-85 percent capacity. With the introduction of the simpler processing required for seaweed flour, many small companies entered that market, which required very little R&D because sales were mainly to pet food producers who knew exactly what they wanted and how to use it. Some of these companies then expanded their operations to produce the PES/PNG grade for human consumption. They make a few basic kappa and iota carrageenans for use in meat products, and to a lesser degree in dairy products. However, they lack the technical marketing skills to sell their products against the larger multinationals. These smaller companies are mainly in the Philippines and Indonesia, and operate at probably about 50 percent capacity and some are possibly struggling to survive. Despite this, new production facilities continue to be built in China and eastern Africa. While there are difficulties in production of carrageenan, marketing can be even more difficult without adequate technical expertise to assist customers in the use of the product. Producers of refined carrageenan are not especially interested in selling the less expensive PES grade if such sales are going to replace sales of their refined grade. So there are opportunities for PES producers to penetrate the human food market with their less expensive product, if they are willing to invest in the technical expertise needed to service those sales. This has already occurred in the United States of America, where about 20 percent of the market is now PES grade. There appear to be similar opportunities awaiting PES producers in European markets that are still predominantly users of the refined grade (H.R. "Pete" Bixler, 2002, pers. comm.). Source: H. Porse, CP Kelco ApS, 2002, pers. comm. In developed markets, such as the United States of America, Europe and Japan, all known applications are almost fully exploited. There could be some expansion by replacement of some of the gelatin market because of health concerns about bovine spongiform encephalopathy, but also due to a growing vegetarian population. Elderly people tend to use more processed foods in their diets and as this population increases so too will carrageenan consumption. Taking these factors into account, a 2-4 percent growth per annum can be expected in developed countries, and there the market splits about 50:50 between dairy and meat applications. In areas such as Central and South America, Eastern Europe and Southeast Asia, growth will be stronger. Here the per capita consumption of carrageenan should increase by 50 percent over the next five years, due to market penetration alone. Allowing for population growth and assuming a moderate economic growth, an expansion of carrageenan consumption by 5-7 percent per annum is likely. At present the market is split into approximately 20 percent dairy and 80 percent meat applications, but this is likely to change with a gradual increase in the dairy foods market (H.R. "Pete" Bixler, 2002, pers. comm.). For further details, see Bixler (1996), who discusses recent developments in the manufacturing and marketing of carrageenan and is excellent reading for anyone interested in obtaining an overall view of the carrageenan industry.